From an outsider’s perspective, it seemed Johannes Høsflot Klæbo of Norway would open his World Cup 2018/2019 season with the familiarity of a win. 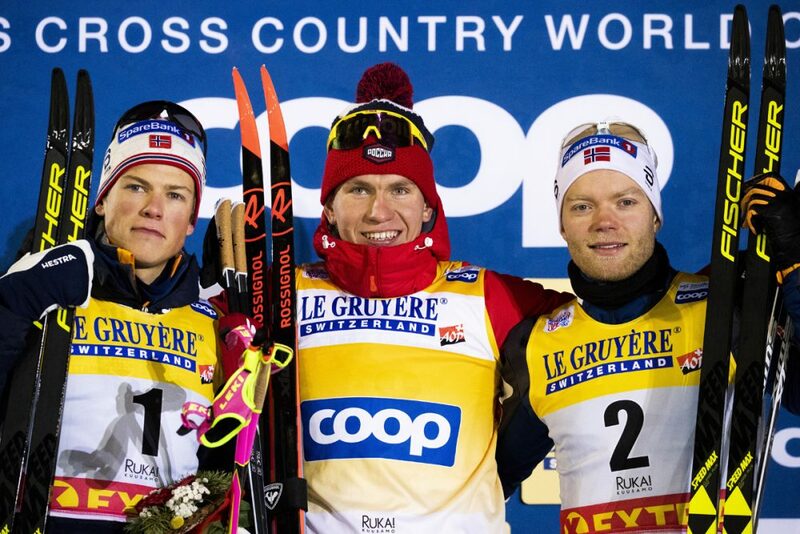 The first FIS cross-country race of the year, a 1.4-kilometer classic sprint in Kuusamo, Finland, saw the 22-year-old round the course’s final turn in first, holding off his closest competitor, Alexander Bolshunov of Russia, by close to two meters. Approaching the finishing stretch, Norway’s cross-country sprint king was still dictating the pace. He seemed well on his way to adding another World Cup sprint title to the eight he already holds. As Klæbo neared the finish line, he paused his double-pole to look behind him. A mis-step that turned into Bolshunov’s chance. While Klæbo glanced behind him, Bolshunov kept his head down and hammered. 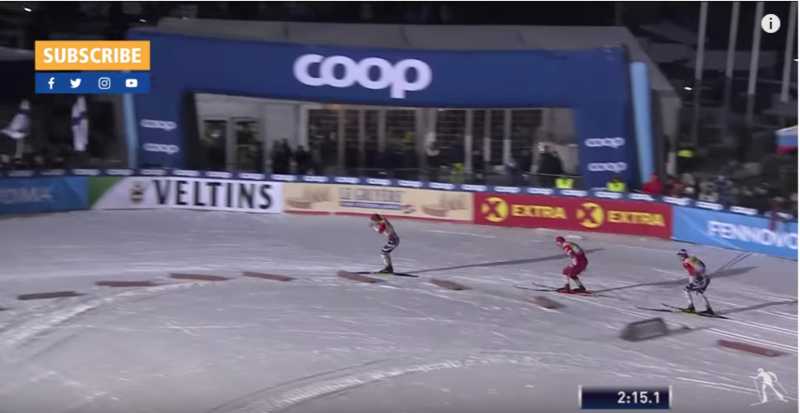 The 21-year-old Russian crossed the finish line first, fist and ski pole raised high, as he claimed the win over Klæbo by 0.31 seconds in a time of 2:29.35. Klæbo, who briefly returned to double poling once he saw Bolshunov, eventually stood up straight, seemingly giving way to a Russian defeat. 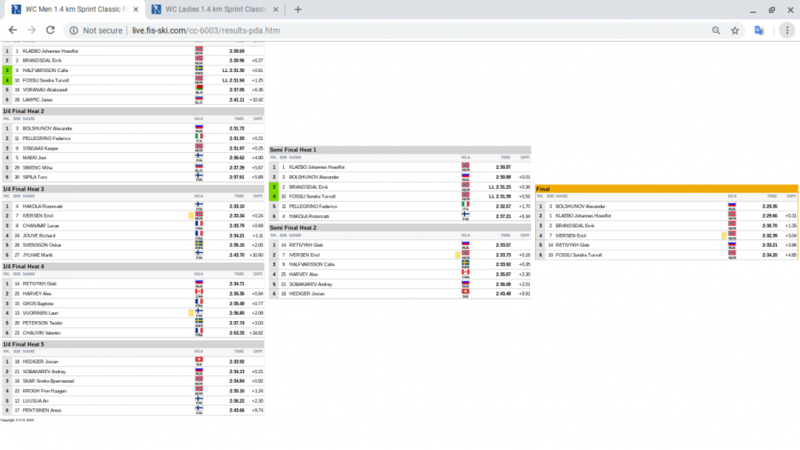 The Ruka sprint victory is Bolshunov’s first World Cup sprint win. Eyeing Klæbo throughout the day, he showed strong positioning and pace. For the duration of the latter half of the sprint final, Klæbo had controlled from the front. At the top of the course’s final climb he had padded his gap on the field and Bolshunov by more than a meter and a half. Earlier in the day, Klæbo had won the qualifier in a time of 2:28.95, the next closest qualifier, Norwegian Eirik Brandsdal, 3.21 seconds behind. Regardless, Klæbo will depart the Ruka sprint hungry for more, as will Bolshunov. Finishing third in Saturday’s final was Brandsdal, 1.35 seconds behind the winner, Bolshunov. Also in the final on Saturday was Emil Iversen, who received a technique violation during his quarterfinal, of Norway in fourth (+3:04), Gleb Retivykh of Russia in fifth (+3.86), and Norwegian Sondre Turvoll Fossli in sixth (+4.85). Canada’s Alex Harvey was the lone North American male to advance to the rounds after qualifying in 25th (+9.40). He advanced to the fourth quarterfinal, where he finished second to Retivykh before advancing to the second semifinal. Harvey crossed fourth in the second semifinal, missed advancing to the final, and ended the day in 8th. “I’m feeling great right now. I was able to execute the plan pretty much to the dot this year, no injury or illness slowed me down and I have a fun time the whole Summer and Fall!” Harvey wrote in and email to FasterSkier. “As per usual, I’m a slow-ish starter so the first goal of the season for me will be the Tour de Ski. Following Harvey’s performance for Canada, Julien Locke (CNST) finished 69th (+15.43), Andy Shields 75th (+18.59), and Russell Kennedy (Team R.A.D.) 76th (+18.61). Five men completed the sprint for the U.S., with American and U.S. Ski Team (USST) B-team member, Erik Bjornsen leading the team in 42nd (+11.41). 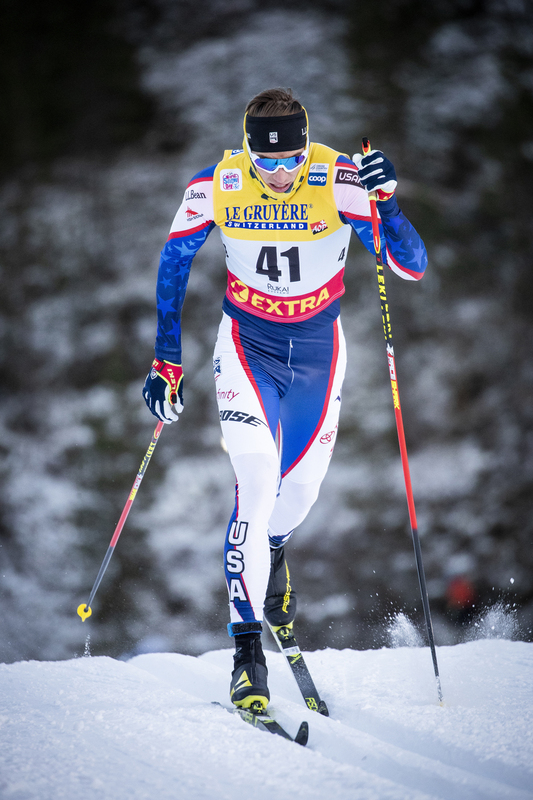 Kevin Bolger, new to the USST B-team this World Cup season, finished in 55th (+13.19), while Ben Saxton of the Stratton Mountain School placed 70th (+15.68) and David Norris of Alaska Pacific University finished 78th (+19.05). Simi Hamilton (USST) placed 82nd (+1:11).